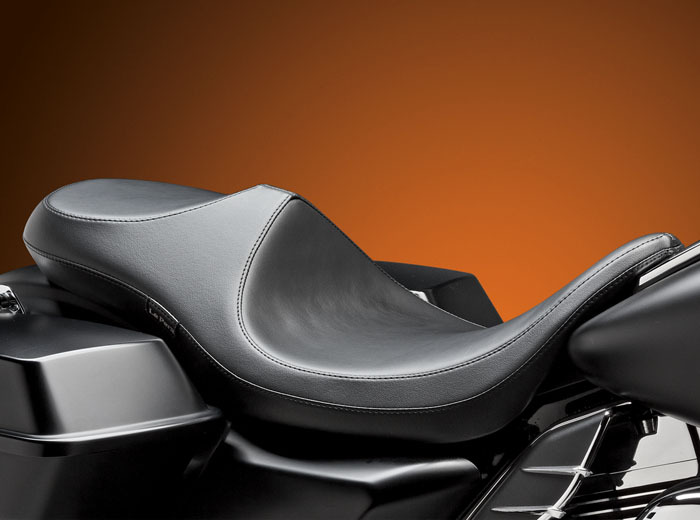 THE VILLAIN IS A TRULY UNIQUE SEAT THAT WILL CHANGE THE LOOK OF YOUR HARLEY-DAVIDSON BAGGER AND TURN HEADS. THE SUPER VILLAIN HAS ALL THE STYLE OF THE VILLAIN WITH MORE CUSH AND SUPPORT FOR LONGER RIDES. THIS IS A GREAT SEAT FOR ADDING FAUX EMBOSSED LEATHER SEATING OR A SIMPLE ACCENT COLOR STITCH. LEPERA ALSO HAS THE VILLAIN DADDY LONG LEGS THAT WILL MOVE TALLER RIDERS 2″ BACK FOR MORE LEG ROOM. AVAILABLE THROUGH OUR DISTRIBUTORS IN SMOOTH, DIAMOND AND PLEATED. FOR CUSTOM OPTIONS, EMAIL OR GIVE THEM A CALL AND TELL THEM YOU SAW IT IN AMERICAN IRON MAGAZINE. Harley Bagger Motorcycle Magazine Sale!